"A part, a large part, of travelling is an engagement of ego v. the world. The world is transport, the roads, the clerks behind the counters who deal out tickets, mail, messy money, keys; it is the porters, the waiters, the tourist industry, the natives, the weather. The world is hydra-headed, as old as the rocks and unchanging as the sea, enmeshed inextricably in its ways. The ego wants to arrive at places safely and on time. It wants to be provided with entertainment, color, quiet, strong coffee, strong drinks, matches it can strike, and change for a large paper note. It wants to find a room ready, warmth, cool, hangers, the right voltage, an ashtray, an enough clean towels. It wants the shop to open and dinner at six-thirty or at half past ten P.M. It wants to be soothed, reassured, attended to, left in peace. It doesn't want to be stared at." And so starts "The Quality of Travel" by Sybille Bedford. This long delightful essay was published by Esquire in November 1961. 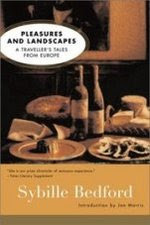 Bedford's Pleasure and Landscapes, a collection of essays about her travel in Europe is a rare find. Bruce Chatwin adored her. And so should you.